River otters have long, slender, bodies and can weigh up to 20 pounds. Legs are short, but powerful with webbed feet. The short dense fur is dark brown. Chin and stomach are reddish yellow, tinged with gray. Females are a third smaller than males. River otters prefer streams, rivers, lakes, estuaries, and salt and freshwater marshes. They eat fish, crayfish, frogs, turtles, and aquatic invertebrates, plus an occasional bird, rodent. Femals bear one to two kits. 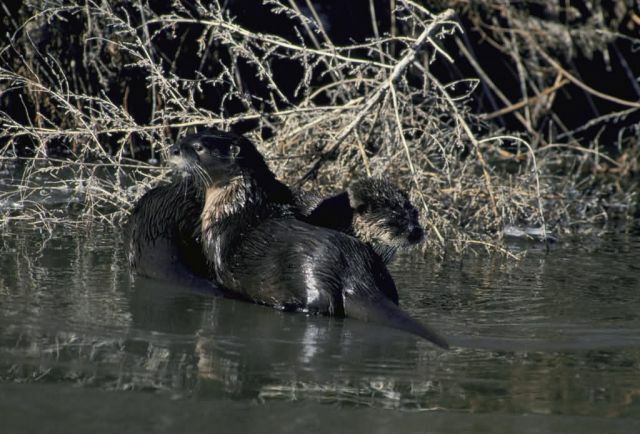 The otter kits start their life in a burrow in a river bank, usually an abandoned muskrat den. Born blind and helpless, they are nursed by the female for about a month, then the mother begins to teach them to swim and hunt for food.